DALLAS, Sep. 10 /CSRwire/ - Texas Instruments (TI) (NASDAQ: TXN) announced today that its corporate and foundation education grants total $8.1 million in 2018, of which $6.9 million (85%) aims to improve kindergarten through 12th grade science, technology, engineering and math (STEM) education. More than 155,000 area students and nearly 7,000 local educators are impacted by the grants, 97% of which target under-resourced students in the Dallas area. Grant recipients include a variety of nonprofit partners in North Texas, where giving back and supporting the community is part of the company’s legacy. Less than half of U.S. high school graduates are ready for college-level math, and less than one-third are ready for college-level science. [i] Magnifying the challenge for Texas, the state’s eighth grade student scores in mathematics have fallen since they peaked in 2011, with only 33 percent of Texas students performing at or above proficiency levels. [ii] STEM skills are a requisite of the 21st century workforce, making the issue of insufficient STEM education high stakes, especially for unprepared students. A STEM feeder pattern within the Lloyd V. Berkner High School attendance zone in the Richardson Independent School District (RISD) in north Texas. 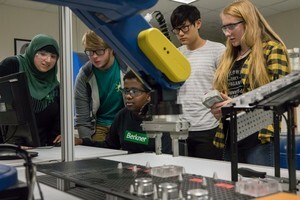 The three-year program will be managed through Educate Texas, the public-private initiative of Communities Foundation of Texas, which is working with RISD to implement a “STEM for All” concept to reshape the teaching and learning of STEM subjects across all grade levels, from pre-K through 12th grade within the Berkner feeder schools. Expanding the National Math and Science Initiative College Readiness Program (CRP) to two high schools in the Irving Independent School District –Nimitz and Irving. Through intensive professional development and coaching, the program will train math, science and English Advanced Placement® (AP) teachers to more effectively teach those courses. Success in rigorous coursework, such as AP classes during high school, is a key indicator of post-secondary success. In effect since 2000, the CRP is a proven methodology to increase qualifying AP scores and to improve teacher effectiveness. The Urban Teachers certification program to recruit and retain effective math and science teachers. The hands-on curriculum is specifically designed for urban schools. The TI Foundation grant will support training math and science teachers in Dallas ISD, and in local KIPP and Urban Teachers charter schools. A new, advanced STEM education program for public school principals through the University of North Texas at Dallas Emerging Teacher Institute. The program is implementing an innovative approach to preparing the next generation of school leaders to nurture school campuses to achieve uncommon STEM and Career and Technical Education outcomes for students. The program will train 30 principal candidates, providing them with graduate degrees and principal certifications. Other supported initiatives include: KIPP Texas Public Schools in the DFW area, a public charter school network that is currently educating nearly 3,000 kindergarten through ninth-grade students in southern Dallas; middle school and high school robotics competitions -- a proven way to increase STEM engagement among participating students; and the Texas Instruments Innovation in STEM Teaching Awards for the Dallas, Garland, Lancaster, Mesquite, Plano and Richardson school districts. TI's commitment to education, which dates to the company's inception in 1930, remains its highest philanthropic priority. During the past five years, TI’s philanthropic commitment to education totals nearly $150 million and joins giving with volunteering to grow more STEM-capable students. In addition to grants, TI encourages employees to give their time as mentors, tutors and other volunteer roles. For more information about TI's support of education please see www.ti.com/education. Read about TI’s approach to giving at www.ti.com/giving or in the Corporate Citizenship Report at www.ti.com/ccr. The Texas Instruments Foundation, founded in 1964, is a non-profit organization solely funded by Texas Instruments providing philanthropic support for educational and charitable purposes primarily in the communities where TI operates. Committed to supporting educational excellence, the foundation works to create measurable, replicable programs and initiatives. The focus is on providing knowledge, skills and programs to improve STEM education and increase the percentage of high school graduates who are math and science capable. More information can be found at www.ti.com/education.